Do you remember the early days of Heavy Metal? The time when bands like Iron Maiden, Black Sabbath and Dio helped form the genre into what it is today? Do you remember the vocals, the fast-paced guitars, heavy bass riffs, the sound in general? The lyrical content was dark, defining the genre and separating the founding fathers of metal from the rest of the music at the time, creating a place for all of the bands that would follow in their path. 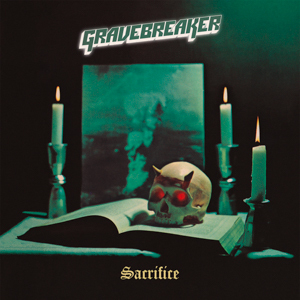 Swedish old school heavy metal band Gravebreaker have rejuvenated that classic sound with their debut album, Sacrifice, giving us a modern take on that iconic classic sound. If you were to take, Iron Maiden, Black Sabbath, add a splash of Dio and Motörhead in for flare, and threw them into a huge metal blender, this is the sound that you would get from the mixture. The heavy fast paced riffs of Maiden and Motörhead, the funky yet metal bass lines of Sabbath, the keyboards of Dio and the vocals of a freak love child of Ozzy, Lemmy, Ronnie James Dio, and Bruce Dickinson, would create a awesome sound, wouldn’t it? That’s exactly what you get from Sacrifice. 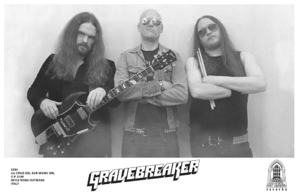 Gravebreaker created a time machine for their listeners to take them back to a time when heavy metal, was just that, heavy. This album was a mind-blowing experience for me. Sacrifice gave me everything that I loved about classic metal, but throwing in their own elements to make this album their own, not a copy or a mimic of the days of old. From the opening of “Overdrive” I was hooked, the fantasy based lyrics about dragons and warriors all the way to the bass lines, that you can actually hear in the mix of instruments, it created a unique experience that most modern music hasn’t done. It made me feel as if I was hearing Metal for the very first time when I was five years old. From start to finish this album was a heavy head bang nod to the music of the past, with standout tracks like “Overdrive,” “Gravebreaker,” “At The Gates of Hell,” “Kill and Kill Again,” and “Messenger of Death,” Sacrifice is a release for the classic metal head in all of us, that kid sitting on the couch while our dad’s introduced us to the music of his generation and the music that we will tell our children about when they are old enough to understand. If you are a fan of Classic Metal you will not want to miss this release, which is available now from Gate of Hell Records.